As temperatures begin to plummet, we recognize that some of our neighbors are out in the cold—as many as 600-800 people most every night, year around. Instead of talking about “homeless people” in Greensboro, many of our partners—including The Servant Center, the Salvation Army, and the Interactive Resource Center (IRC)—express it as “people experiencing homelessness.” This intentional phrasing points to the fact that homelessness describes the current state in one’s life, not the person themself. For many, just one unexpected circumstance can push them out of their home. However, more systemic issues such as lack of affordable housing and income stagnation also contribute. So how can we as a congregation make a difference in the lives of those experiencing homelessness? We focus on a strategy that addresses a basic need: employment. With our support, our partners at the IRC are launching a new energy-efficient initiative in the Greensboro area that will do just that: Bicycle-Based Food Carts. 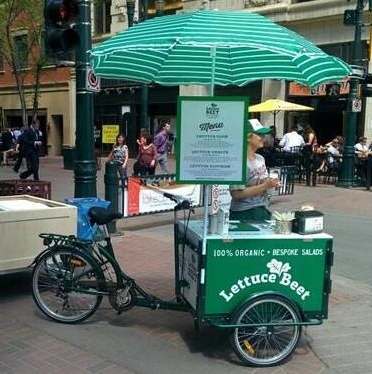 Each Bicycle-Based Food Cart will employ individuals who would otherwise be unable to find jobs. These individuals will maintain the carts and sell the food items for a wage of $15 per hour. In addition, each employee will retain their profits. Through this initiative, each individual who participates will find themself after 12-18 months with either enough funds to purchase their own food cart and start a business, or the requisite skills to be employed elsewhere. Our dream for this year’s Christmas Eve offering at Christ Church is to purchase and equip four Bike Carts for this initiative, employing eight individuals for 12-18 month periods—and our goal is to raise $12,000 toward that dream. Through this microeconomic venture, we will be part of not only putting people to work, but offering a strategy toward self-sufficiency and housing stability. We can make a difference this year by engaging in community development that will directly provide employment opportunities for our neighbors in perpetuity. Together, we can change lives. Learn more about the way our partners are addressing homelessness and our Christmas Eve Offering Initiative at the Missions Café.